The morning is spent writing, drinking whatever juice I have available in the fridge, eating the last energy bar, and chewing gum as last resort. There is a restaurant in the hotel which seems empty every time I pass by, commanding prices that tourists are deemed to pay for the same food that is available for a fraction of the price outside, and yet there are no street stalls in the immediate vicinity of the hotel. In the light of day it is evident that the Old Palace resort is really a good choice of budget accommodation, very pleasant, relaxed, clean, private, and also spacious, considering how little I am paying. It would seem that getting large window space in budget hotels in Thailand may not be the struggle as it is in other countries in Asia, and this hotel certainly is no exception. The room features a small television of absolutely no value to me, a fridge, good working wifi, ample cupboards to pack away my belongings, and a really large bathroom with a green opaque glass bowl sink, a surprisingly artistic touch for such a cheap hotel. The wood terrace that flanks the rooms is relatively deep, laid out with driftwood furniture, and bound by a white picket fence, beyond which lie the asymmetrically positioned private bungalows, presumably more expensive, also with large windows, high slanting tiled roofs, the entire lot sheltered by a canopy of mature trees. Leaving the hotel, I find there are some impressive street stalls adjacent the Wat Na Phramen, a man tenderly disemboweling jackfruit, the meat incredibly rich and tender, and further along, a woman making muffins of sorts using a batter of what appears to be shredded taro and red beans, which she subsequently dices and then serves with some chopped cilantro and a sweet hot sauce. 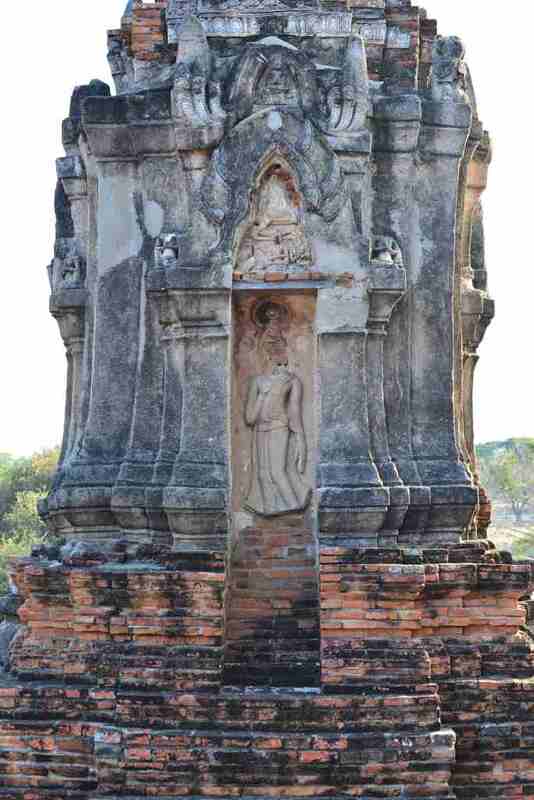 The structure of the temple appears contemporary, although it originates from the 16th century. Perhaps the evidently historic portions of the temple complex are visible in the areas that require paid admission, which I never get to, given what befalls my camera. Leaving the hotel room again late in the day, I should make an effort to actually see some of the plethora of temples that abound throughout the town, although I am strangely compelled to ride my newly acquired rental bicycle into the opposite end of town. 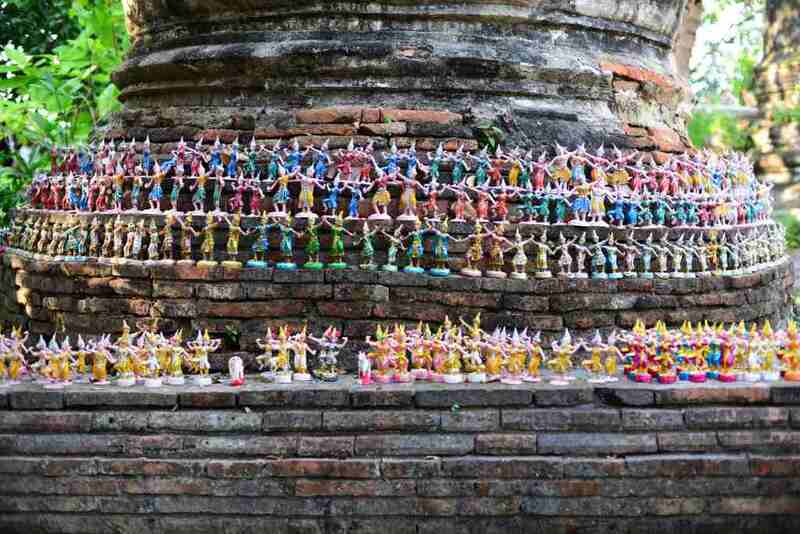 I rationalize my momentary disinterest in the most important archaeological site of the country with the notion that I will be so overwhelmed by Buddhist temples in the next few months I could well stand to moderate the daily intake from the get-go. The contemporary version of Ayutthaya is fairly underwhelming, with its small and somewhat grimy businesses, mildly chaotic traffic, smattering of street-side eateries, some larger retail and office spaces reflecting larger brands, Thai and international, but little that could be considered compelling. Knowing that a decent coffee is always available here, I continue to meander through the side streets until I come upon a small locale that is completely given over to a retro decor with somewhat of a Hello Kitty twist, loud Thai techno playing, and uniformed school children cavorting wildly through the establishment. You really have to give the owner top marks for originality! A few short blocks to the west, the grandiose temples and palace complexes command the broad arteries of the town. My first stop is the Wat Ratcha Burana, a site whose genesis in 1424 is the tragedy of two brothers dueling to their deaths for the right to ascend to the royal throne. 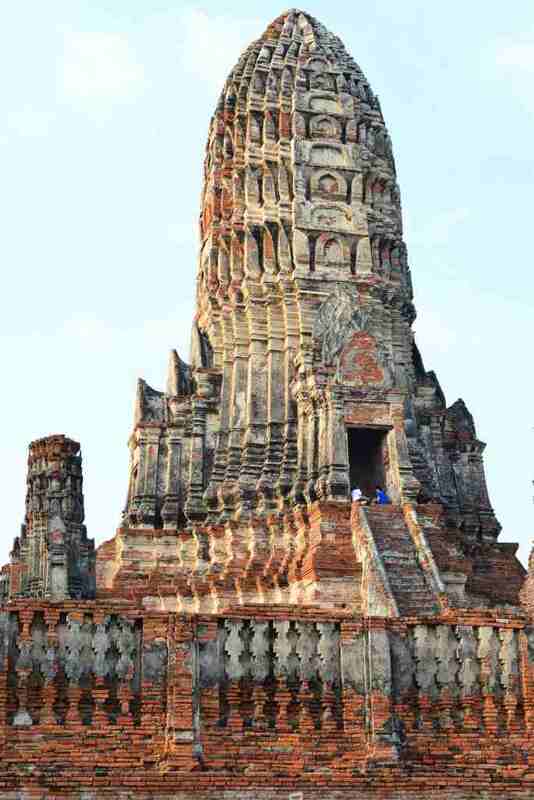 The central prang or temple spire of the site is allegedly one of the most outstanding in Ayutthaya, and the central crypt once housed priceless treasures of the era that were naturally looted and never reappeared. 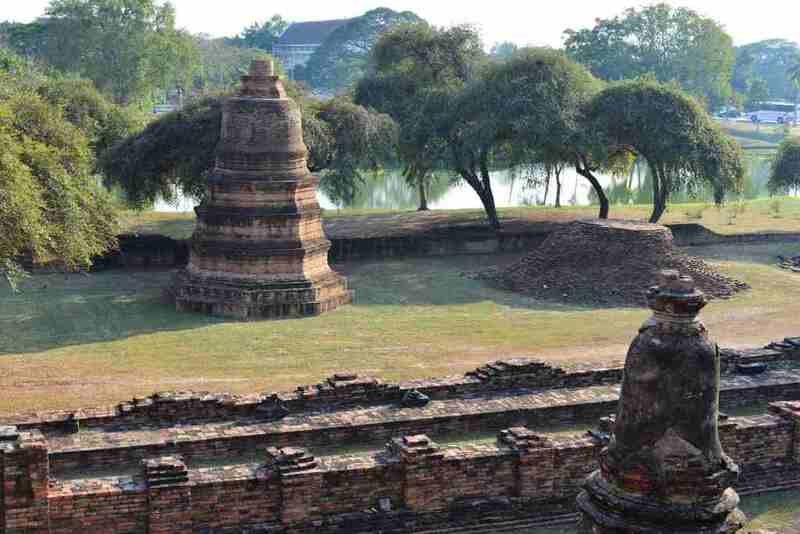 The original complex was walled and the central prang flanked by rows of impressive stupas, time having served to weather the stucco off the underlying brick construction that at times sags or has often altogether collapsed. 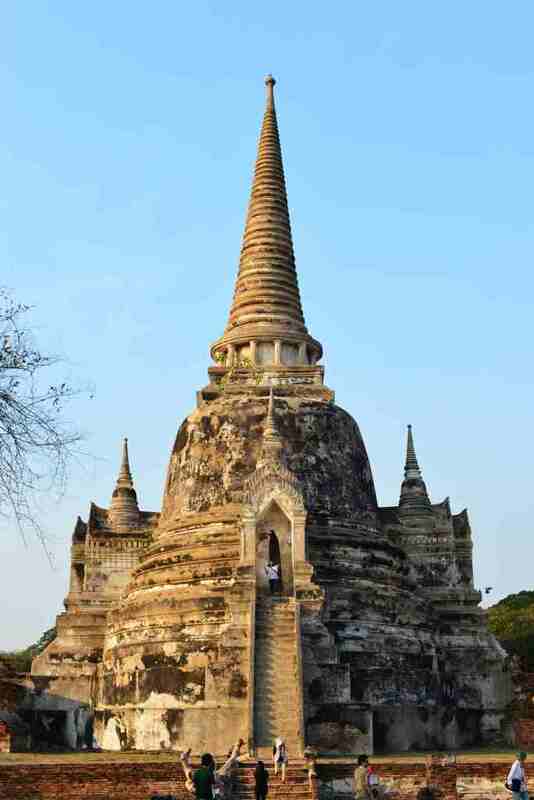 Stupas were created to ascribe positive karma to the sponsors, and could serve one of a number of functions, such as the commemoration of some event, the housing of sacred relics, or represent some symbolism relevant to Buddhism. 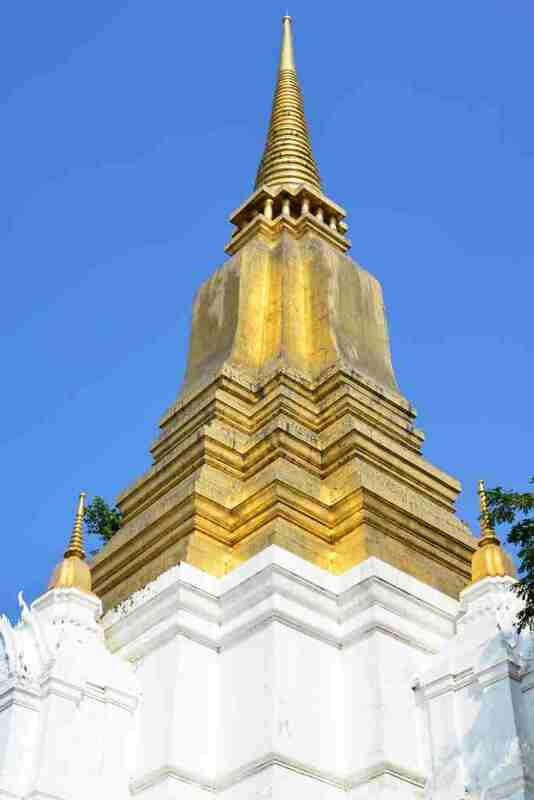 The individual elements of the stupa are also intended to represent the essential elements of the world. I traverse the site in the now growing heat, crossing the short cropped grass which hopefully won’t be hiding any poisonous snakes and the like in search of the perfect shot, although everything will look the same after a while. Curiously, two older Germans navigate a camera drone ostensibly to capture detailed imagery from parts of the central prang that would not easily be accessible (certainly not without the erection of some sort of platform). 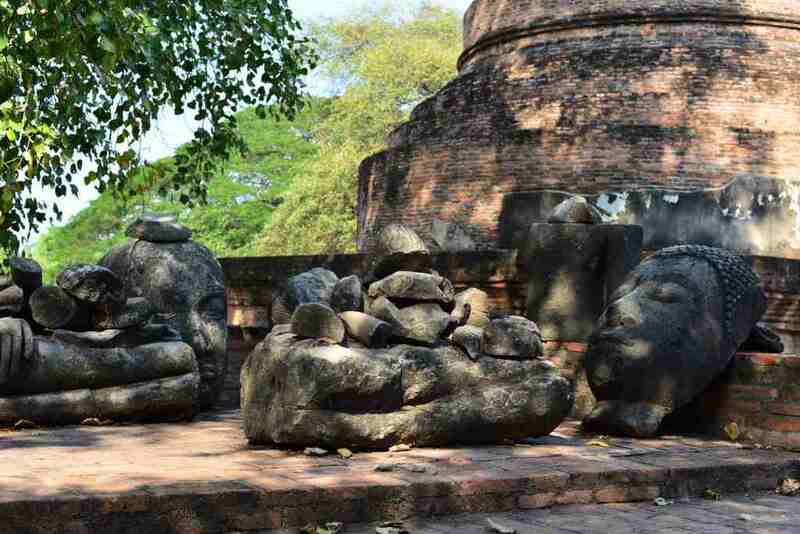 Remnants of stone statues lie atmospherically in rows alongside some of the weathered stupas, resting in the shade of the mature trees that have taken root on the temple grounds. 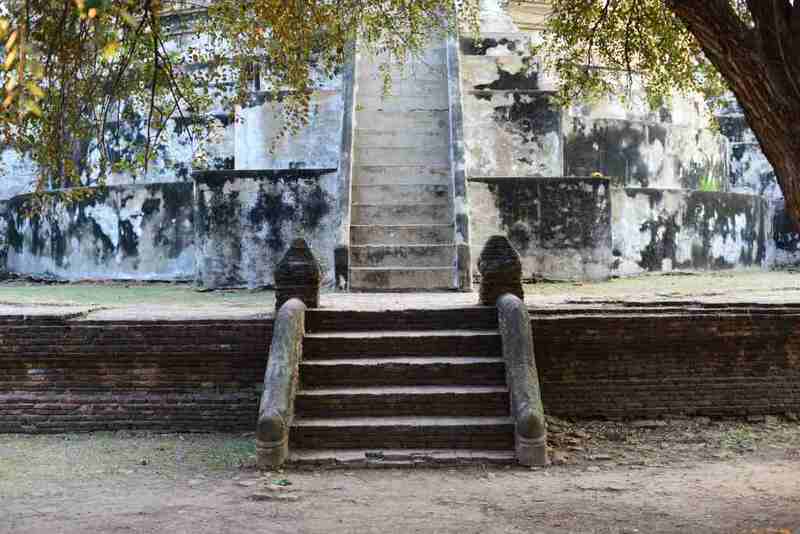 It is possible to safely climb the lower stairs of the central prang, although it probably would not be too wise to attempt to climb the higher disintegrating and very shallow steps, given how big my feet are and how heavy my pack. One wrong move is all you need here! 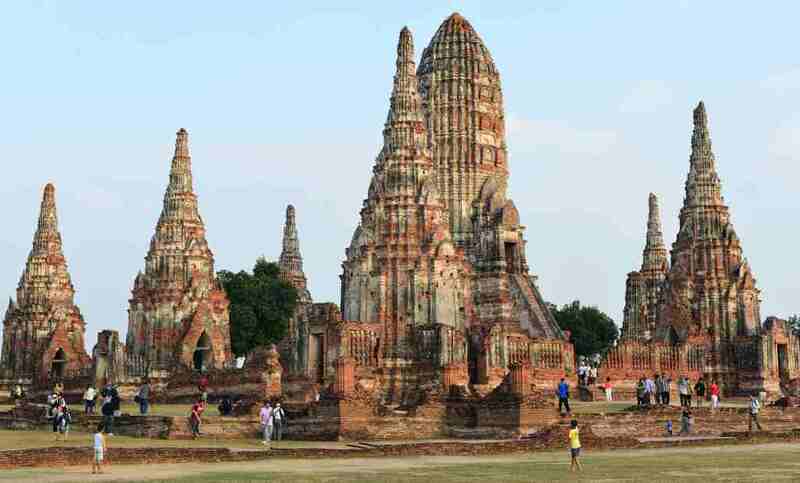 The Ayutthaya kingdom’s dominion over the central Thai lands extended from the middle of the 14th century to the late 18th century. 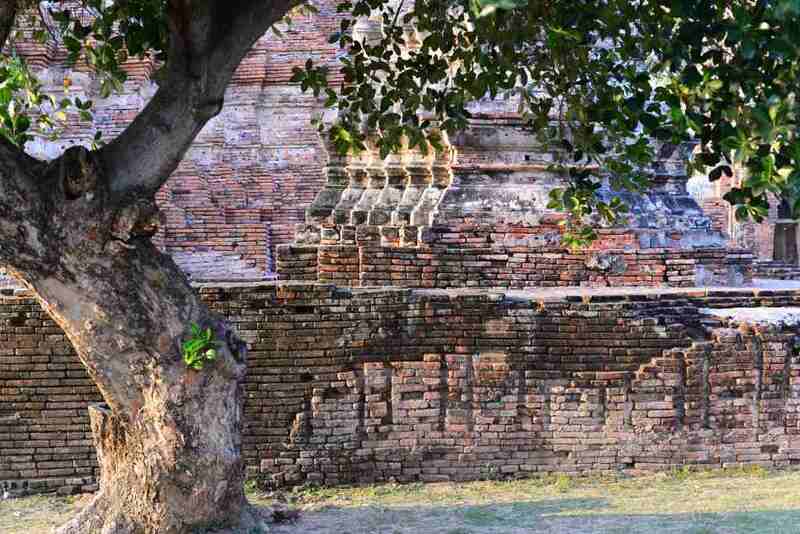 It sustained ongoing conflicts with the competing domains of Malacca to the south in what is now Malaysia, as well the Burmese, who successfully conquered and subjugated the Thai on a number of occasions through that period. 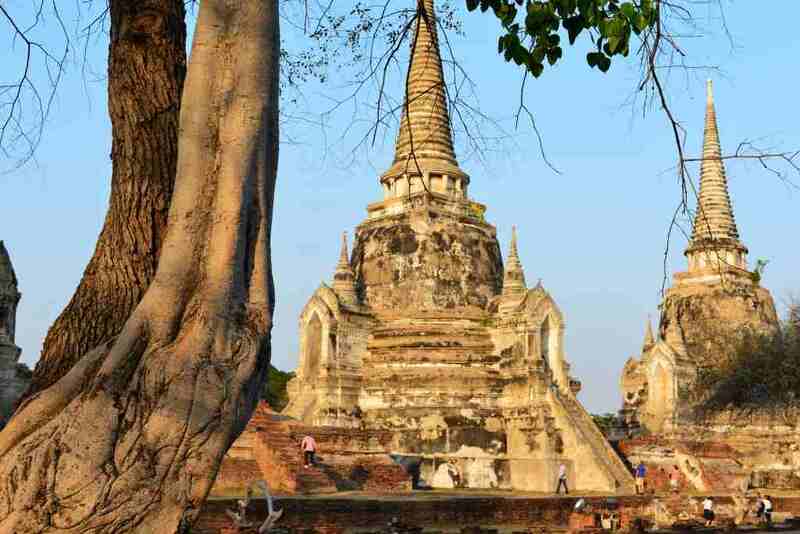 As the kingdom prospered due to successful trade, its ability to maintain vassal states diminished, leading to its eventual demise at the hands of its long-time Burmese foes. 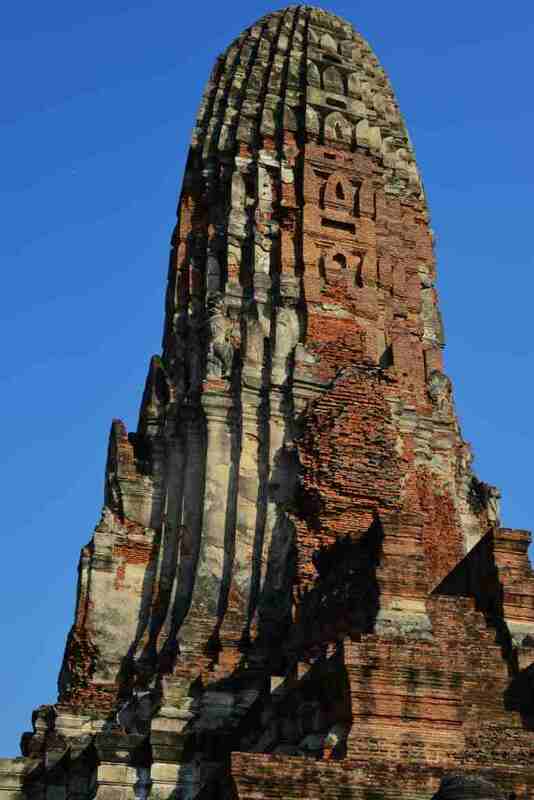 What remains is a rich tapestry of temple and palace ruins heralding the days of Ayutthaya’s position as great Asian state, although much of what is visible is in ruins, the more intact structures either newly rebuilt or shoddily reworked with cement and plaster, not that the poor restoration work would drive away the hordes of tourists who visit this place. My efforts culminate with a trip across the street to the Thai eatery, the modest staff asking me what degree of heat I would like in my food, and finding my visible discomfort and sweating at the end of the meal mildly amusing, not that I am bothered – I will probably acclimatise to the spicy food as I always do. And not all dishes need to be that spicy. Trundling on my bicycle further to the west side of the town almost exclusively dedicated to the ancient temples and palaces, I enter the Wat Phra Ram, similar in structure to the preceding complex, featuring corner towers set in a courtyard with a central gallery focusing on a towering prang, in the Khmer style set out at Angkor Wat. 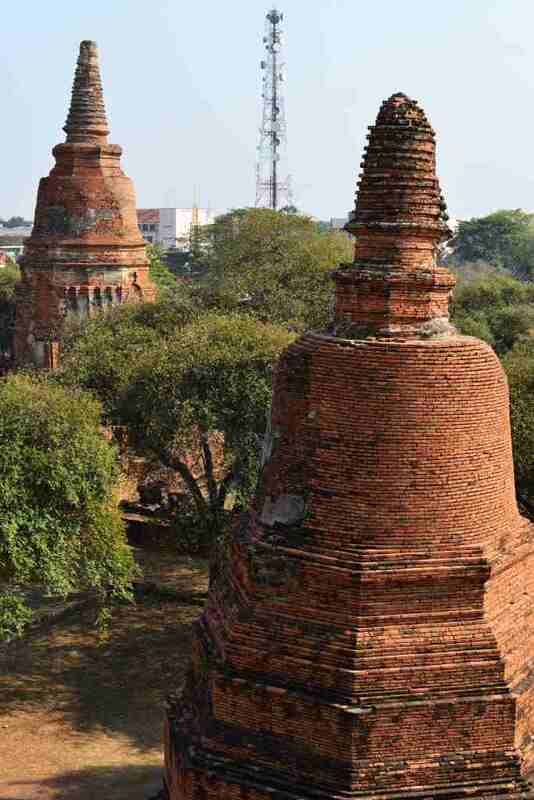 Rows of stupas line the grounds, the red brick set against the heavy green canopy of the trees that abound on the lot, stucco restoration work apparent in some cases, illustrating some of the complex decorative aspects of the site that have largely vanished into the mists of time. I cross paths with Ellie, a passionate photographer originally from Colorado but now having lived for many years in Bangkok, supporting herself in her commitment to photographic artwork and other projects that sustain her. We share stories of the places we have visited over the years, the experiences of yesteryear disappearing with the increased globalisation of media, tourism, commerce, and so on. 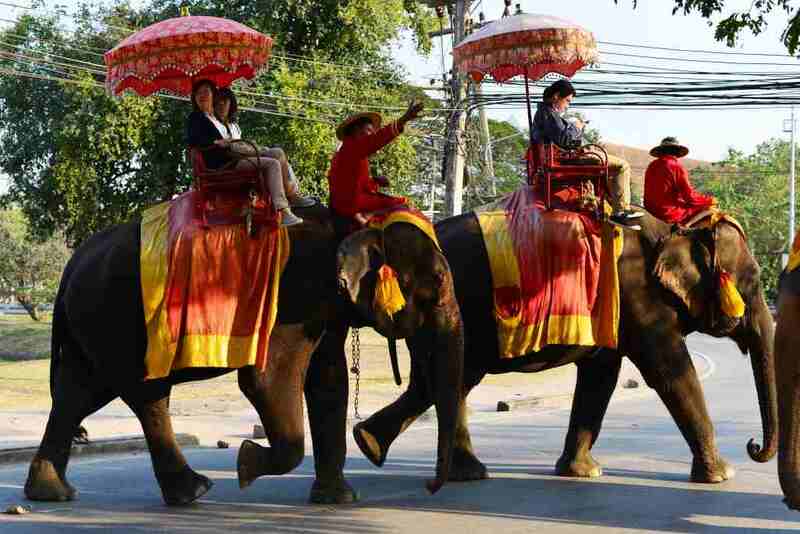 Next to the Wat Phra Ram temple is the elephant ride staging area, where the large majestic creatures clad in brilliant raiments take all manner of tourists on their slow, swaying walks around the corner, down the street, around another corner, and not far beyond that. 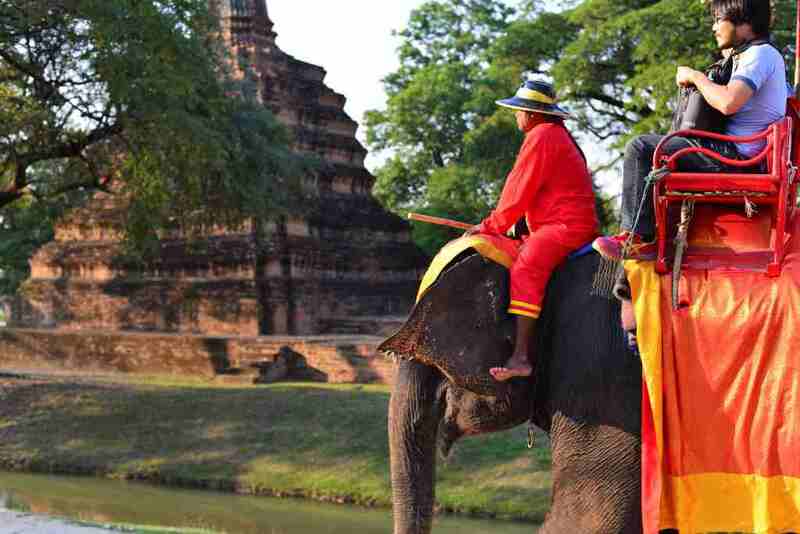 I suppose there is some exotic appeal in riding an elephant here, but it really has somewhat of an assembly-line feeling to it. The departure point for elephants is part of a larger facility over some uninspired park land marked by close-cropped grasses and spindly trees, the sheer cut of the grass a disincentive for a lot of the less salubrious vermin that would happily conceal itself in deeper grasses. 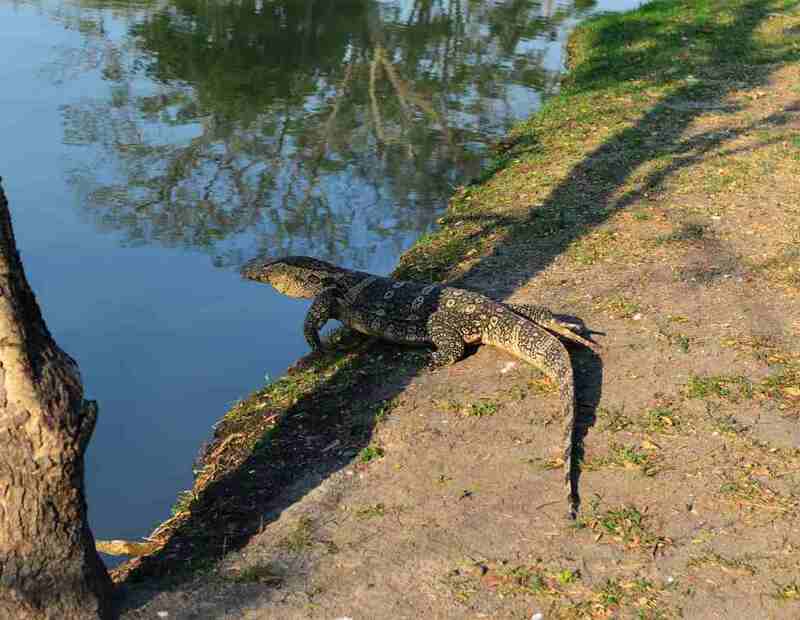 A brilliantly mottled monitor lizard lunges forward to the safety of the small lake, hesitating before jumping in as I very slowly close in on it. The complex to the back is supposed to feature a floating market of sorts, but all it consists of is innumerable vendors of somewhere delectable, somewhere somewhat unusual snacks, at least as seen from a conventional western perspective. I am not sure what is meant to be floating here, other than your spirits from ingesting heaps of sugary treats, including candied fruit, raw fruit, cakes, sweetened rice crackers, candied peanut brittle, offset by the amount of dried and salted fish and decimated deep fried meats. 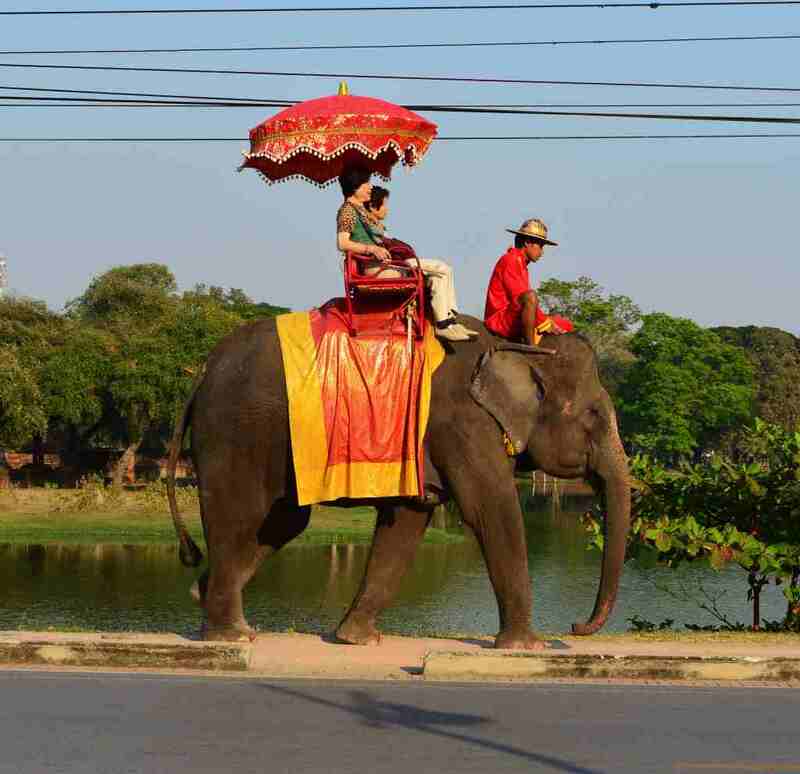 One thing I have to happily concede to the Thai – even with all the strange organ meats and fish that abounds, you are not overwhelmed by rank odours as would be the case in other Southeast Asian countries. And behind the floating market, the Wat Phra Sri Sanphet that I had been looking for before, one of the main historic attractions of Ayutthaya. Rows of elegant stupas delimit the temple complex, some clad in weathered stucco and others in exposed in red brick, the smaller nothing more than inverted bells, the larger ones featuring steep staircases leading on each of two sides to raised porticoed chapels, distinct concentric rings running the perimeter of the lower stupa as well as emanating towards the apogee of the structure’s spire. Crumbling remnants of halls to the side of the central temple would have been used for assembly, prayer, or perhaps for the purpose of monastic habitation. 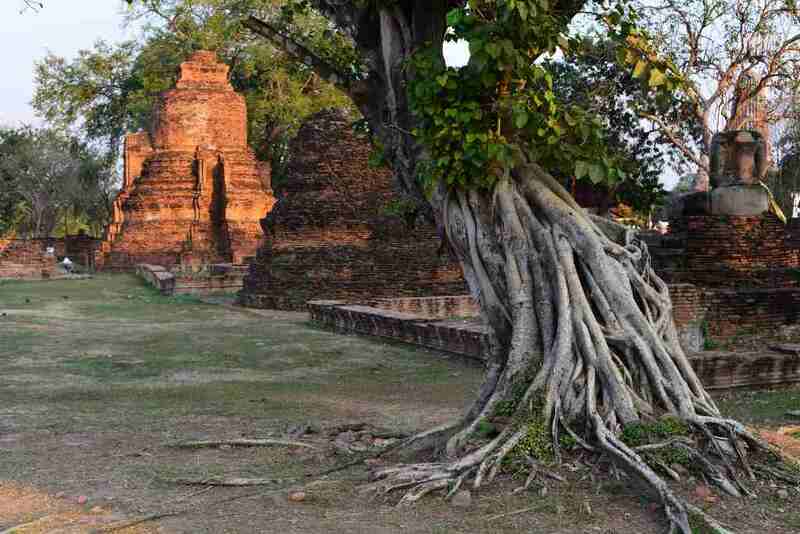 Small bodhi trees weave their sinuous magic amidst the ancient ruins, an ever-present reminder of Buddha’s ascent to enlightenment. With dusk approaching, it is time to call the short day’s sightseeing efforts to a close, and perhaps just roam along the temple-strewn side roads of Ayutthaya to the south end of the island, a host of businesses including even an inviting and somewhat fashionable coffee shop beckoning from the confines of Uthong road running the outside perimeter of the island. Leaving the coffee house, it is now dark, and I am not sure to what extent the intent cycle trip around the island would have much merit. The small headlamp strapped to my forehead is of little use, considering that that the road running the periphery of the island is well lit, running past large institutional structures and on the outer river back, enormous temple complexes, palaces, and surprisingly, historic Christian churches, bathed in amber lighting. I weave through the town, the trip surprisingly quick, and the streets ample enough in their breadth to assure a degree of comfort riding this maladroit girl’s bike. I continue past the access across the canal to the Old Palace Hotel and then onwards into town, the east side of central Ayutthaya resplendent in the evening’s commerce, restaurants spilling out onto the streets through town, business presumably surging with the incoming weekend. I finally locate the night market, off the main boulevard, next to the Telecom tower, occupying the length of the street, roughly half dedicated to clothing, the other half to a dizzying array of food stuffs, most read for consumption. The variety of food is staggering as it enticing, comprising an array of seafood and meat cuts on skewers, either already grilled or waiting to be grilled, finely diced raw as well as deep-fried meats, pre-made and bagged sauces, marinated foodstuffs, such as galangal, ginger, mango, and so on, grilled bananas, diced fruit, including mango, pineapple, papaya and jackfruit, juices and smoothies made from every manner of fruit and vegetable, pre-packaged cake slices and other sweet pastries, bare bulbs illuminating the individual stands. Only a small number of sit-down restaurants are present, and so I can’t imagine being too choosy at this point. I sit down for a dinner of somewhat dubious tom yam behind one stand, joining a Frenchman at the adjoining table. Jean-Marcel has had the good fortune of having spent the last few years working for Médecins Sans Frontières (MSF) in the DRC and CAR, and I can’t imagine there could be much worse places to have been, not that the work that MSF workers do isn’t incredibly critical. The discussion turns to the inevitable topic as to why Africa – or at least some of Africa – is such an unmitigated disaster. The poorest countries have nothing, no infrastructure of any sort, and no one seems to be particularly anxious to expend any effort to improving matters – it’s always up to the foreigners to make a difference. How is it that these cultures fundamentally don’t take the initiative to move ahead, and in fact even in other African countries the sense of ambition and consequence in life is quite different, east Africa being relatively functional and economically viable. Locals often blame the differing politics of the French colonial masters versus the policies of the English, although Jean-Marcel things the issues are more complex. As much as the central African countries are undeniably hopeless, the developed countries in the world are hardly bereft of their own problems. Despite its relative sophistication, Kenya is largely troubled by the substantial Somali presence both in terms of internal populace as well as the vagaries of the neighboring country. And in Europe life is not easy, France being a case in point, where whatever shortcomings the country faces are overwhelmed by the deep pessimism of the populace, out of synch with their actual standard of living. He struggles with this a lot too but he was essentially an outsider in Paris before leaving for South America, having lived as a theater director in an independent alternative community, and has little sense of what the conventional French mindset would be nowadays. Returning back the Old Palace Hotel in the now abandoned night time streets of Ayutthaya, I manage to avoid the rabid dogs until three decide to chase me on one stretch, although I elude them by peddling as quickly as possible. I may as well practise for the potential onslaught of aggressive monkeys in Lopburi, where I will traveling to next. The hotel is almost full, the weekend closing in on us, but thankfully, the place is quiet, or at least attracts more of the quiet sorts. 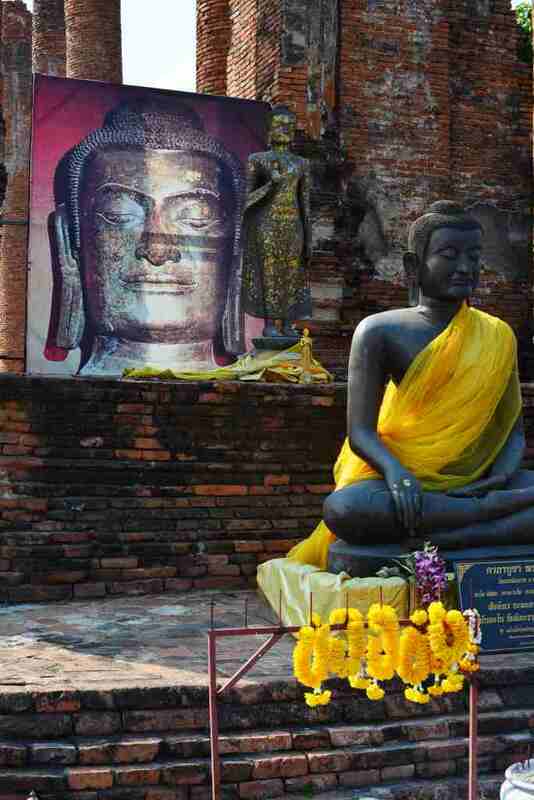 Ayutthaya will certainly get lots of weekend visitors from Bangkok, given that it is not so far away. It also helps that my room is at the far end of the terrace, beyond which is a small green space abutting other unrelated properties. My feet are absolutely killing me, which is not a good sign. I have been alternating between the shoes and sandals, but each seems to be taking their toll on my feet, and curiously, the bike riding seemed to impact the feet negatively. I dread the possibility of this situation escalating out of control – on prior trips I seem to have been lucky enough to be able to keep it in check, but this time I may not be so lucky. On the upside, I see foot massages advertised frequently so hopefully they could help. I leave the hotel characteristically late, as in 2 in the afternoon late, which seems a bit ludicrous, considering I allegedly came here to sightsee – or did I? Good question. The Old Palace resort is really a comfortable place to hang out, and I can definitely see myself spending the days here commuting between the hotel and the street vendors hanging out across from the Wat Na Phramen, not that their food is really that good, but eating there simply feels comfortable and familiar, and the fact that I can get really fresh jackfruit gives a sense of homecoming. Then the Hunsa the short distance on Uthong road towards town provides a miniscule but very funky fallback position, with its colourful tiles, heavy unfinished wood tables, a huge teddy bear jammed in the window next to the entrance, a high ceiling overlooking the small space, and two roads of tables and chairs arranged intimately amidst a clutter of foliage in front. 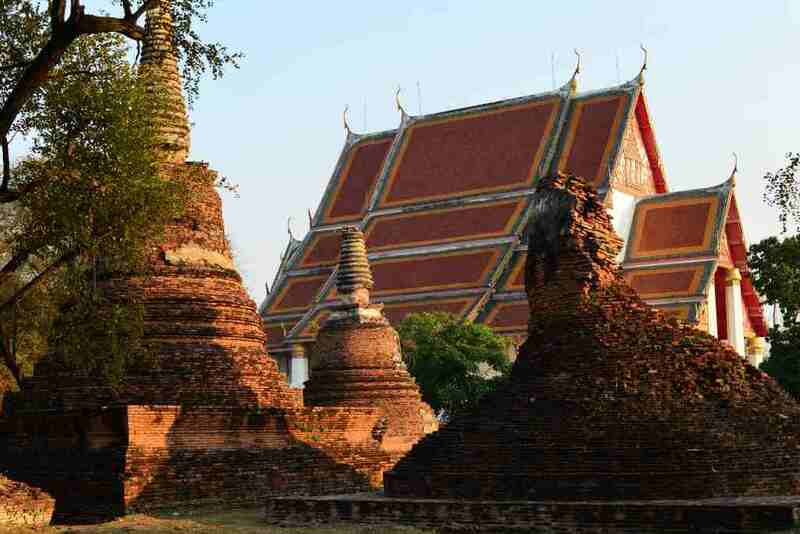 Taking the path of the least resistance, I visit the Wat Thammikarat immediately across the street, however unimportant it may be. Then again, I had in any case decided to visit all of the sites situated along the riverfront road today, and this will have to be the first one. 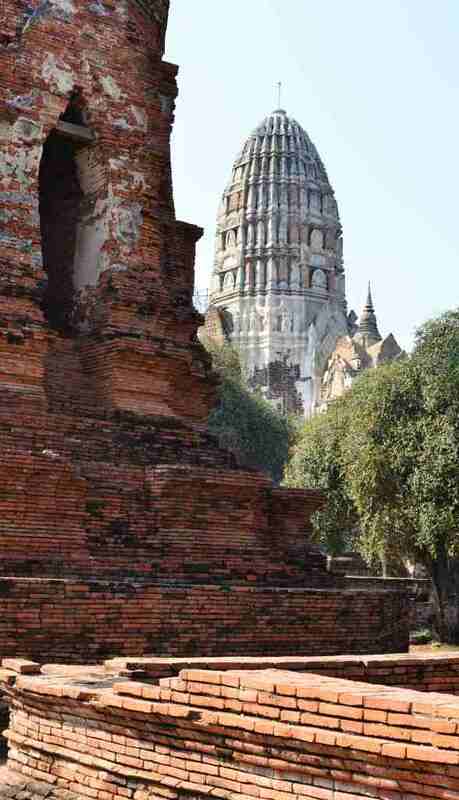 But the original monastery actually pre-dates the Ayutthaya period, some of which has been restored, newer structures having been added to the site. The walls of a large hall are flanked by columns, built of red brick of which the cladding has again altogether worn off. Adjacent the temple complex is an expansive field with nothing more than the foundations of ancient temples, for which no description is provided in on the tourist map. 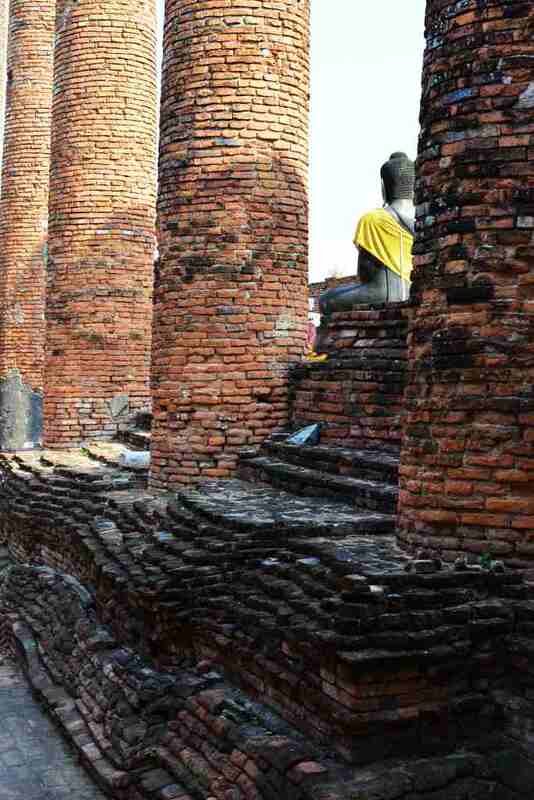 Unlike most of the archaeological sites on the island of Ayutthaya, this is a living place of worship, throngs of visitors filing through the trellised passage past the table with the clay votive tablets and the aloof monks, then climbing up the shallow staircase to the ruins of the ancient hall, bowing as they clasp smoking joss sticks before the images of Buddha. A row of flowering bushes leads to the parking area, and at the back of the complex, an arc of mature trees, the ribbons tied to one indicating its dedication as spirit tree. Adjoining the hall, a stupa sits, guarded by a perimeter of rearing stone lions. En route towards the bridge leading off the west side of the island, the religious and institutional structures visible from the road yesterday, including the grounds of the Art Institute, which I visit for no particular reason other than the fact that it is there. I wouldn’t expect to see much in the way of traffic at this facility, considering that it is Sunday, although there is a group of uniformed youth filing towards the golden pavilion at the back of the site. A maze of sculpted shrubs and bedded flowers lend the colonial-styled buildings an enhanced sense of propriety. 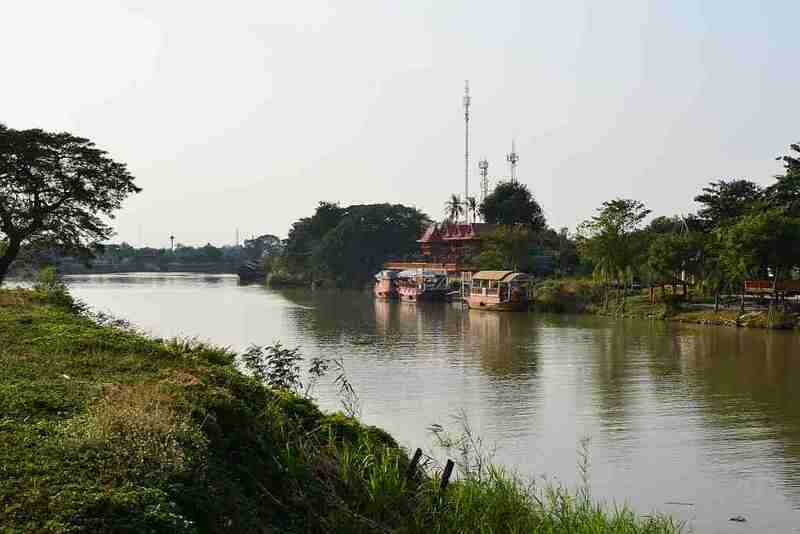 Back onto the girl’s bike, and I am off again, lunging over the bridge’s incline and soaring back down again onto the mainland, now arcing all the way around the southwest of the island towards Wat Phutthaisawan to the south of Ayutthaya. This time the journey is longer than expected, the somewhat nondescript environment characterized by fairly lavish houses, built with dark stained wood, raised off the ground, featuring staggered roofs whose gables usually feature embellishment, culminating in an arced finial, and often encompassed by a verandah, and situated on leafy green properties. Given the town’s royal history and its proximity to Bangkok, I would expect some fairly wealthy and privileged people to be maintaining residences here. I am somewhat surprised by the number of Moslem people in town, who I continue want to greet in Malay, which would probably not be very appropriate. The children of one family yell at me as I cruise into a back lane, yelling ‘no, no’, presumably because the road leads no further than the mosque, which couldn’t possibly be my destination. 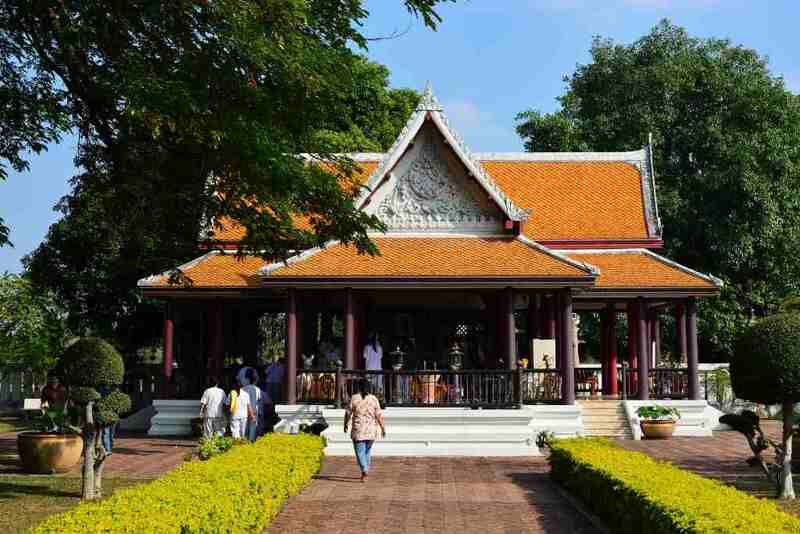 Wat Phutthaisawan is located at the end of a side road next to the south bank of the Chao Phraya river, built in the mid-14th century to commemorate the defeat of the Khmer in some conflict. Most of the visible portions of the temple seem new, the temple with prang towering overtop being built at the front of the lot intended to mimic the older structure with courtyard set further to the back. The encompassing courtyard is lined with golden Buddha statues in enclosed galleries, while steep steps lead to elevated chapels at the front and back of the prang. 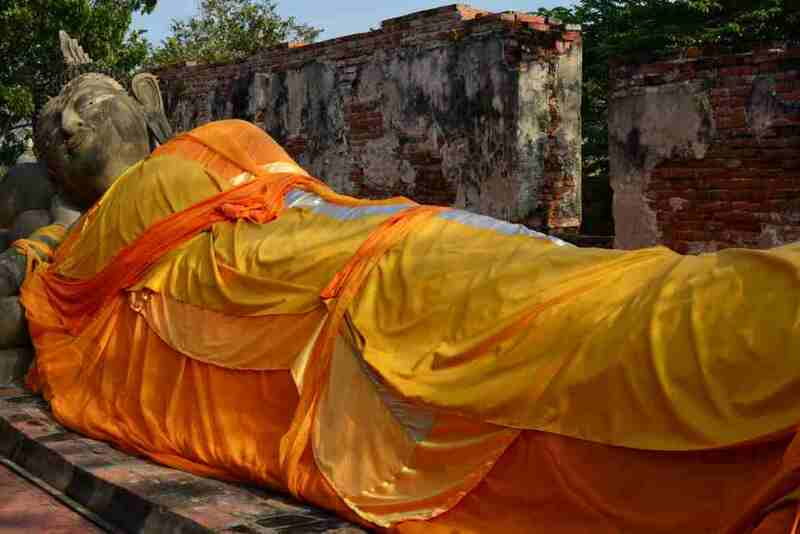 An open pavilion houses an enormous reclining Buddha statue at which people prostrate themselves with burning joss sticks, oblivious to the stray dogs running rampant on the lot. More prosaically, the daughter of a ice cream vendor cavorts enthusiastically over her mother’s ice cream wagon as the woman shows me samples of her homemade wares, butchering a long banana ice cream stave in two as the tip of the knife risks stabbing her daughter in the face. 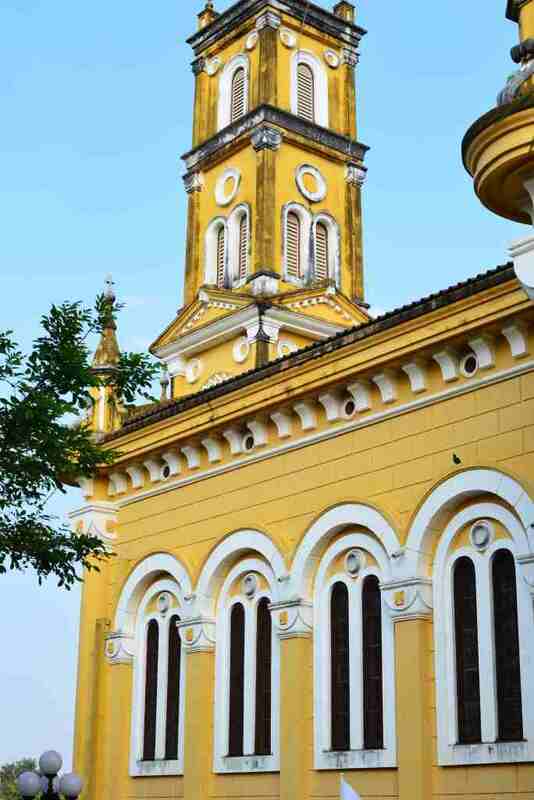 To the west lies the church of St. Joseph, built over three hundred years ago on the banks of the Chao Phraya by French missionaries whose work was in fact considered an affront to the existing Portuguese ecclesiastical authorities, and beyond its presence as a house of worship for local Christians was the nexus of a conflict between varying religious interest groups. I am shooed away from an artfully composed wedding shoot into the adjoining gardens, delimited by gaudy apostolic statues framed against the traditional Thai houses on the far banks of the river. 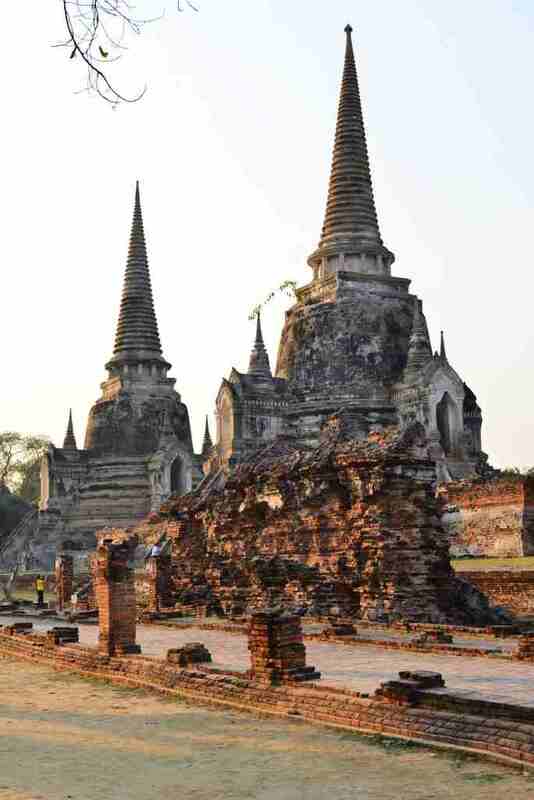 Returning towards the bridge, I visit Wat Chai Watthanaram, considered one of the principal attractions in Ayutthaya due its size, complexity and archaeological integrity. As with many of the other temple complexes, it was built by a king to gain merit in addition to being a dedication to his mother. 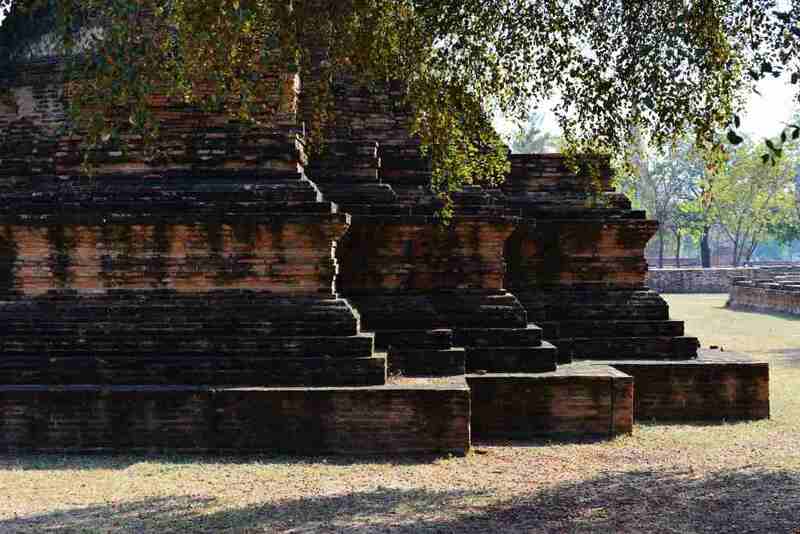 Built in a Khmer revivalist style, it features a walled compound laid out symmetrically on a broader plaza, a series of chedis lining the outer walls centering on a tall and elaborate prang in the central compound. 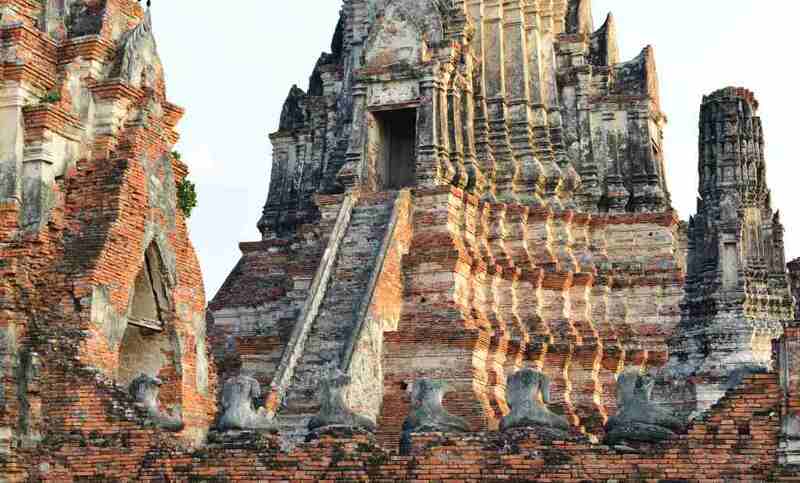 Consistent with much of the ancient architecture in Ayutthaya, the chedis feature steeply inclined façades, with shallow terracing on four sides culminating in their pointed peaks, the central prang similar except for the larger size, squatter shape, and internal chapels accessed by means of steep external staircases emanating from two sides. 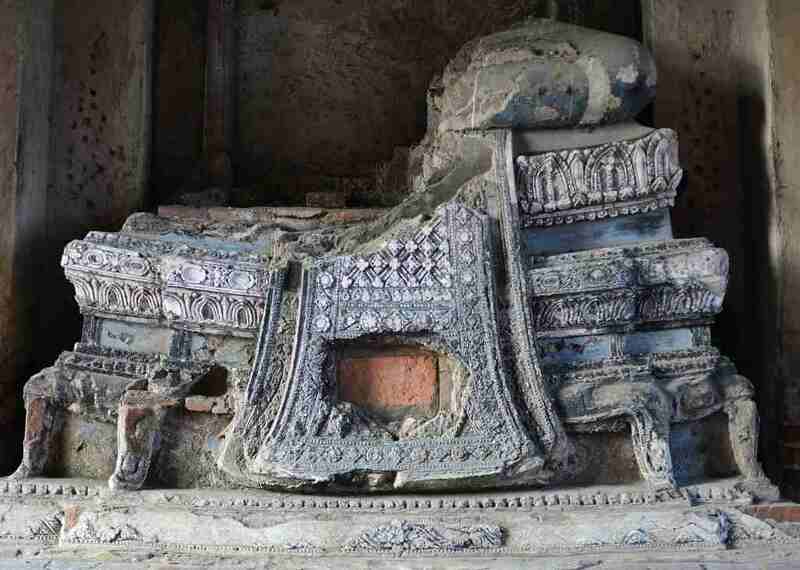 The chedis are traversed by a passage that runs the length of the inner wall lined with remnants of rows of seated Buddhas, the interior of the chedis featuring decayed sculptures reflecting progressive stages of Buddha’s life. Hordes of Thai weekenders point expensive cameras at every possible feature of the temple, often with tripods, although it is not clear what they hope to achieve by shooting the seated Buddha statues framed against the descending sun. A dedicated series of photos alone would be warranted for the number of people taking selfies. I resolutely take photos of all of the architectural monuments, although I have done nothing to actually capture images of daily life in town. The tourist map indicates that there are a number of secondary historic temples north of the bridge connecting the island to the west, but traversing the roads leading from the river, it is unclear to me where they may be. 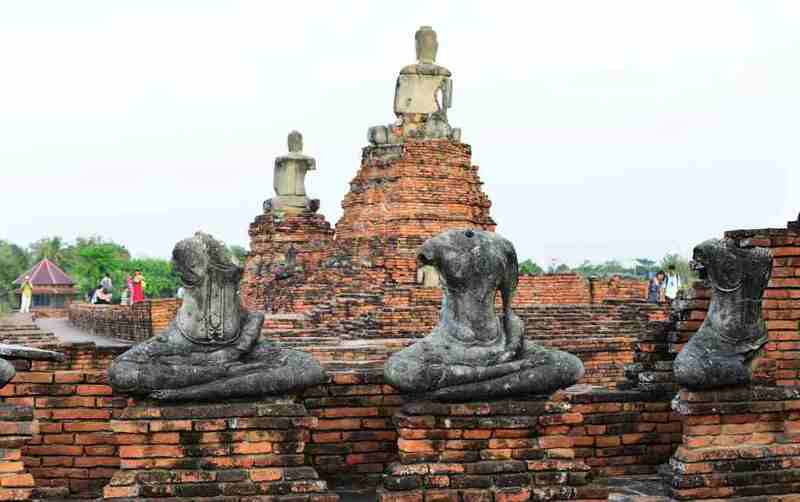 In fact, the entire general area of Ayutthaya is littered with temples, just that the ones sanctioned for tourism have historic importance, which may not necessarily be obvious to the casual foreign visitor. 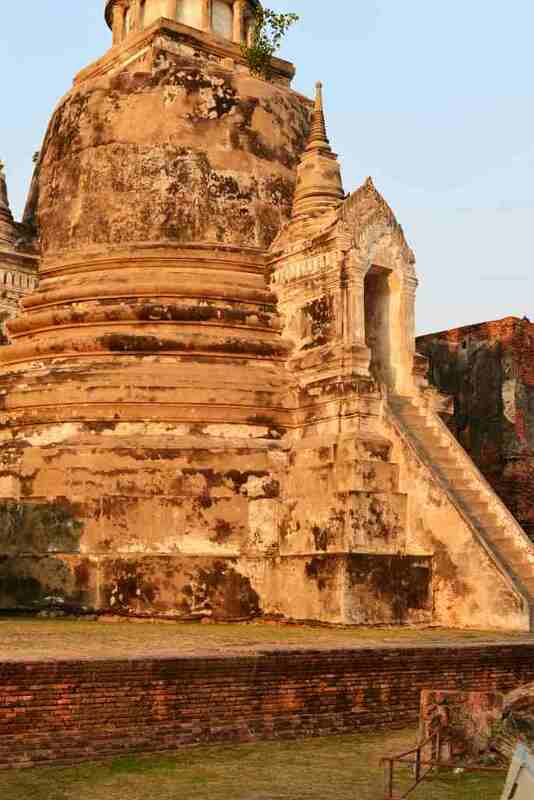 At some point the plethora of temples merges into a radiant backdrop in the landscape of Buddhist countries. With dusk setting it, it may be time to find somewhere to eat, the sprawling eateries a block south of the night market I visited yesterday being the obvious choice, a long row of vendors displaying all manner of unappetizing raw and prepared meats, largely tending towards innards, some servers thrusting menus enthusiastically into my hands, although right now I am simply dehydrated, and the orange, banana and kasturi lime smoothie at the kiosk at the far end will do just fine. I leave the humble bicycle locked up next to the motorcycles and large trucks, not possibly being able to imagine anyone motivated to steal it. Amidst the dizzying array of the night market, a baggie of broad flat sweet rice crackers amended with red beans, fresh jackfruit, and fresh sliced green mango, on the cusp of ripeness, as well as a container of poached corn custard pastries, which will hopefully allow for a more pleasant morning spent writing. At the hotel, the conversation about traveling as well as its delights and challenges continues with Ben and Christine, he from the area of Breda in the Netherlands and she from Australia. Due to his limited English, she does most of the talking, pleasantly articulating the itinerary on her third trip to the country, intended to show the country to Ben, whose experiences in Southeast Asia have been limited to motorcycling through Vietnam with friends. 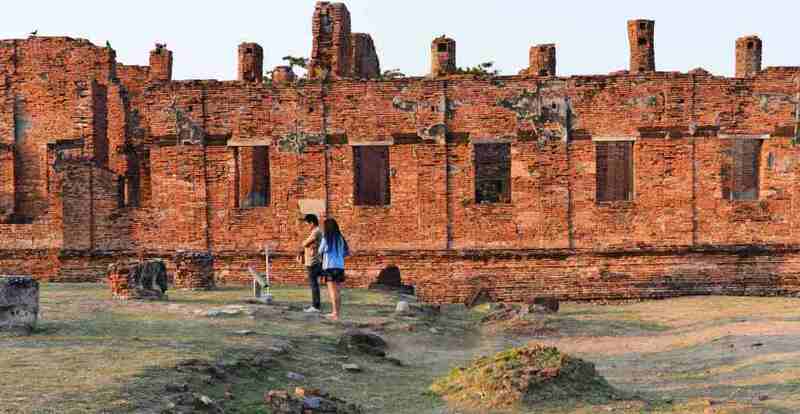 They concede that while Vietnam is far more commercial and aggressive, any areas more likely to cater to tourism will be more difficult to forge sincere relationships with locals and not be gouged at the till. For its unquestionable role as tourist paradise, the people actually maintain a surprising degree of decorum with respect to tourists, something that is evident on an ongoing basis in small interactions with locals, in particular, shop workers and street vendors. The online resources for finding hotels are a panacea, except that it is incredibly time-consuming to use them to find just the right accommodation, taking into consideration contributors’ inexact and skewed agendas, cheaper locations always being farther away, the added cost of service charges, the possibility of finding the same or better hotels by simply walking around, different prices and hotels offered by different online services, and so on. But Christine is smart, organized, congenial, and I can only imagine that they are doing well in their travels from Chang Mai to Bangkok and then on to the islands, where they will be attending a wedding prior to spending their last weeks traveling up to Katchanaburi.